Do you have an effective tool that enables reliable communication between the wellsite and your Real-Time Operations Center (RTOC) experts? Do you require a virtual data administrator to troubleshoot your service contractors issues? Do you require an independent field engineer to ensure seamless data transmission into your RTOC environment? PetroNOC provides the infrastructure necessary to connect your rig side experts with those at the RTOC. This means when a decision is made at the rig, experts at the RTOC are aware and have access to the data, creating a virtual team. PetroVault™ Console is equipped with RigChat to establish direct and secure communication between engineers on the rig and specialists in the NOC office locations. 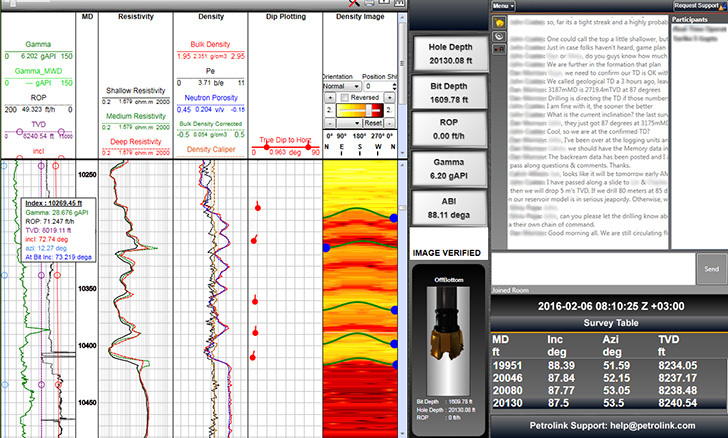 RigChat can be installed as a stand-alone application or fully integrated with the existing real-time displays. Having a rig chat system in place during drilling operations helps reduce NPT, save internet bandwidth utilized by phones and provides a secure and auditable environment for operational collaboration.